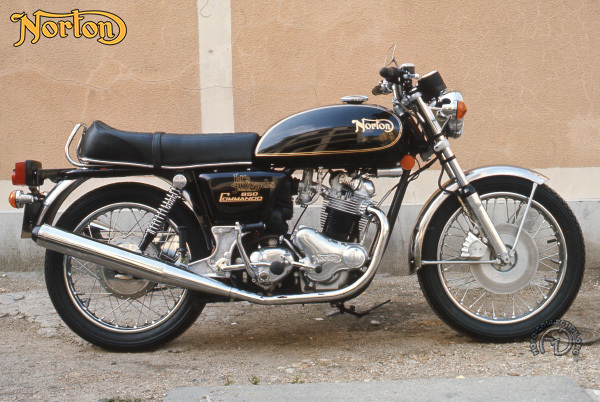 When Norton was forced to bring out a new line in 1967 to keep up with the competition, the gathering financial problems of the British manufacturer forced it to set aside its projects for new power units and use the existing engine of the 750cc Atlas parallel-twin model. This design was long outdated and suffered from terrible vibration. To solve the problem, Norton's engineers came up with the ingenious idea of combining engine, transmission, rear fork and wheel as a separate subassembly on sturdy mountings. The first Commando with an Isolastic frame had been born. Interstate remained in production until 1978. A modified version appeared in 1975 with an electric starter and the gear selector on the left, Japanese- style.